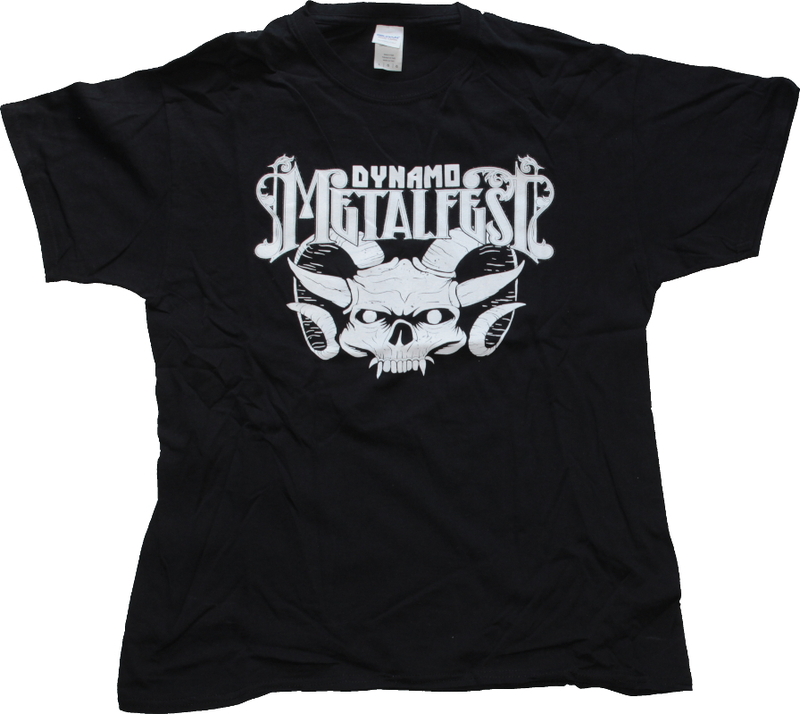 July 18th 2015 was a memorable day, again a metal festival was held on the ‘Kunstijsbaan’ in Eindhoven, once home for the famous Dynamo Open Air festival. 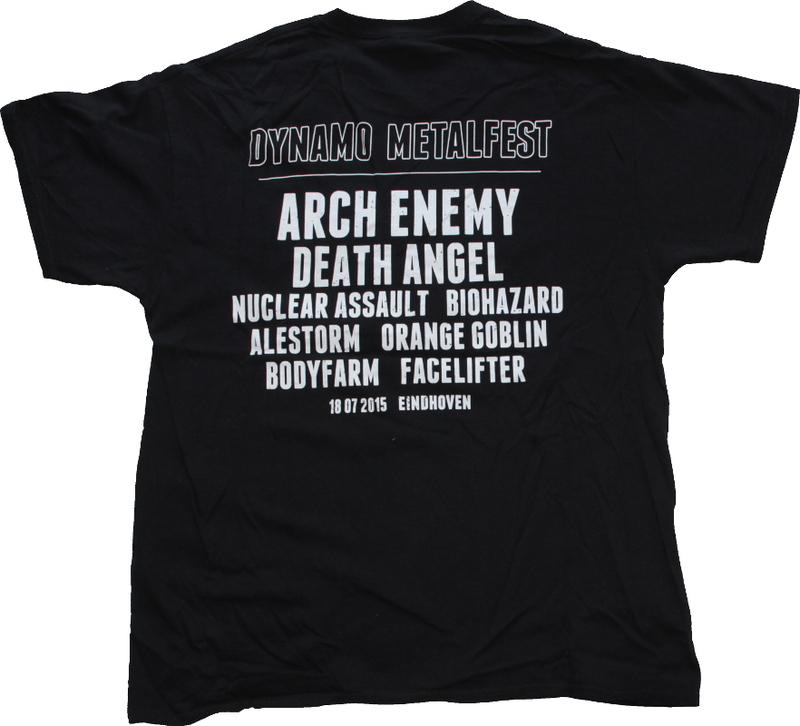 This festival was called ‘Dynamo MetalFest’, so it looks like it was linked to DOA. But the source of the name is the local club ‘Dynamo’. It is a one day festival, for a low-price (just 15 euro!) and a limited number of visitors (5000). One week before the festival, it was completely sold out! Two days before the festival I got a ‘leftover’ ticket from someone. So I could be part of the beginning of something potentially legendary festival. 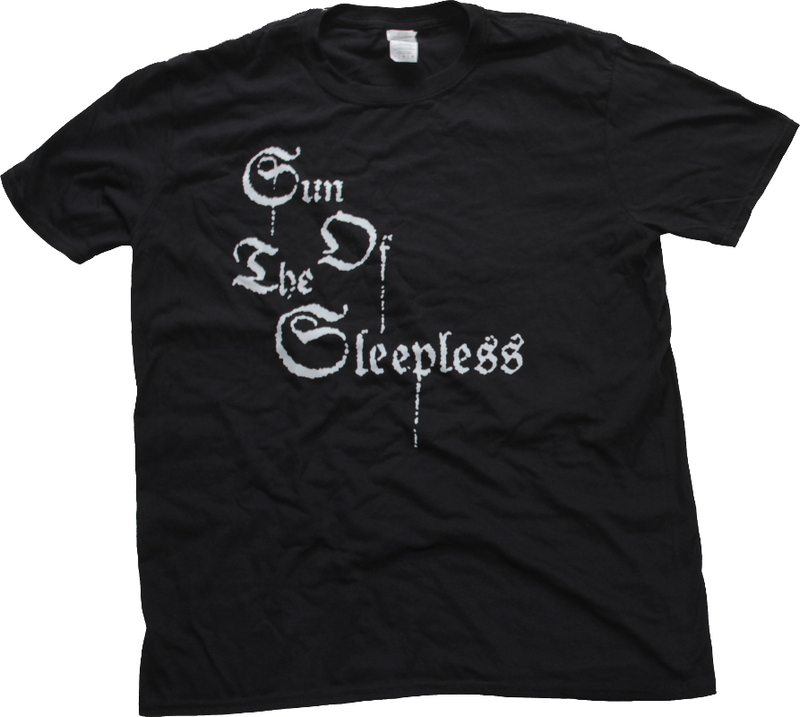 Even the shirts went fast, most men’s appearal were sold out before half of the bands have played! Only the black and white was available in my size. There was also a fullcolour shirt with the same design. Sun Of The Sleepless is a soloproject of Schwadorf (the Vision Bleak, Empyrium) and has released it first full length album. As soon as I heard this, I ordered a copy of the album and it came with a Digipak CD, the out-of-print 1999 MCD “Poems To The Wretches Hearts” in a cardsleeve, a patch and an autographed/handnumbered certificate in a hotfoil-embossed box and a shirt. Nice! 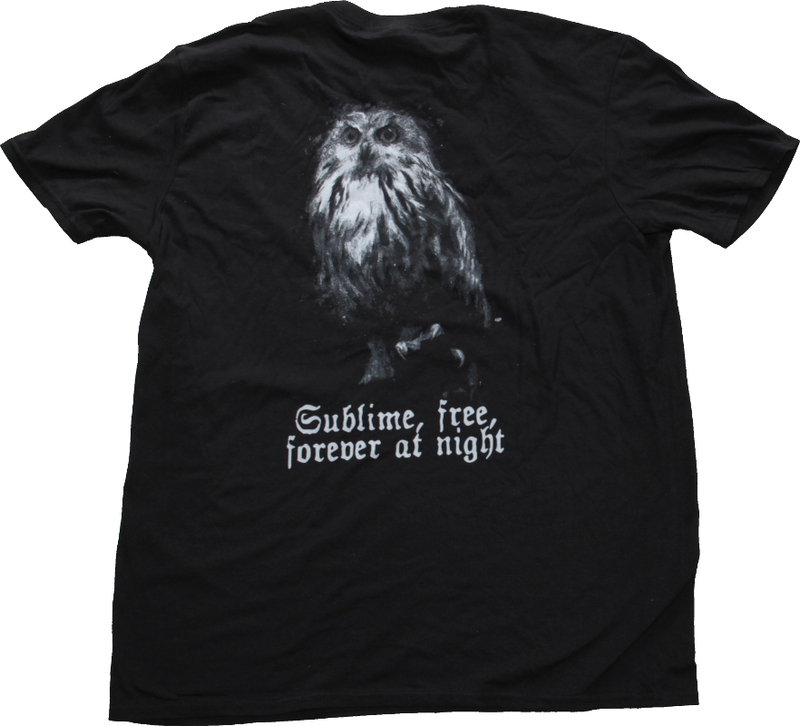 On the front the logo, on the back an owl with the text ‘Sublime, free, forever at night’. A promo-shirt with backprint! When I was a bit younger Toxik played at the Dynamo Open Air festival in 1988. A legendary show, but I wasn’t there. Today I got a new chance to see them on the exact same ground. Everyone a bit older, but Toxik made me forget my age ;-). The first corwdsurfers of the day were seen, and the pit was started. On the set also some new songs of the upcoming new album. 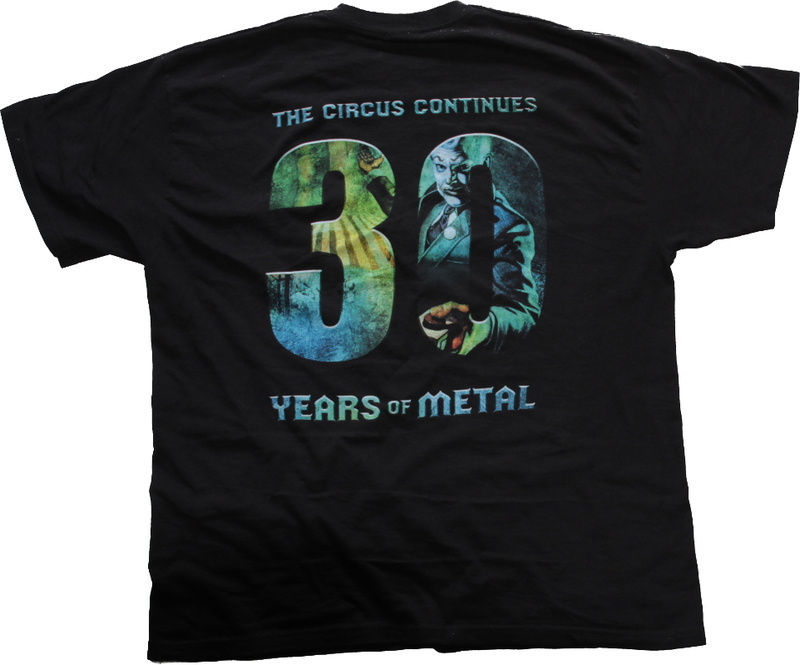 Shirt I bought had the Toxik logo on the front and on the back a little reminder of our age: The circus continues 3o years of metal. One of the bands on Dynamo Metal Fest 2017 I had to see was Exodus. A great thrash band and the last couple of years they always have a great show. Maybe it is “Zetro” who is back, but I think the chemistry is right on stage. Gary Holt was on tour with Slayer (again), but they can do without them (although it would be great when he joined them again someday). Two kids were brought on stage (family of crew or DMF volunteers?) during the final notes of the last song to beat the strings of the guitars. Would be a great memory for those two. Maybe a little improvement could be made to play other songs. The songs played today did rotate on the setlist for the last few shows I saw them. And their discography is large enough to grab some other songs. A few days before DMF Exodus announce a festival exclusive shirt. 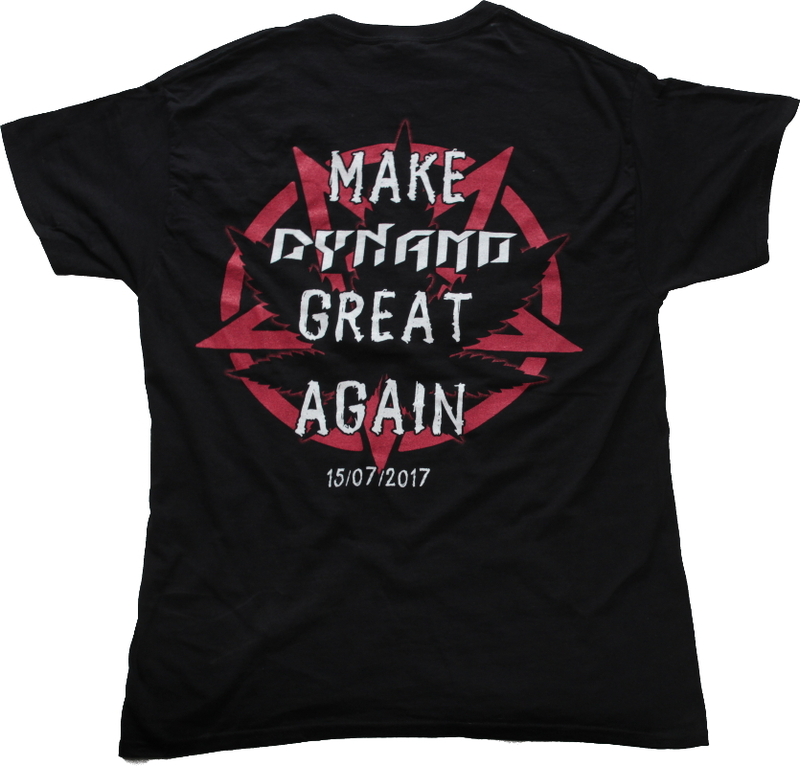 Exodus logo on the front in red-white-blue, on the back a reference to Dynamo: Let’s make DYNAMO great again (and here it is a great statement to make something great). I would like to thank the guy who saved my shirt in the pit. I lost it, but he returned it to me! White Boy Wasted, VUUR, Toxik, Prong, Entombed A.D., Exodus, Devin Townsend Project, Testament and Gojira. First band White Boy Wasted was missed, there was a big line of people outside. Took me almost an hour to get in. Just in time for VUUR the new band of Anneke van Giersbergen. It was the festival debut for the band, and it was a good one. Be sure to check their album out when it is release (somewhere in october 2017). Then it is time for some golden oldies. They did visit Eindhoven in 1988 on the exact same place. And they weren’t the only ones today who visited Eindhoven on the legendary Dynamo Open Air. They played a nice set with some classic songs and a couple of new ones. Prong couldn’t keep my attention, nice set though. The Death’n roll of Entombed A.D. was great, luckily they played a couple of old songs. Exodus nailed it! A really great set. one hour of pure oldschool thrashmetal full of energy. The crowdsurfers kept going on and on, and of course a chaotic wall of death was also part of the deal. Then it was time for the multitalent Devin Townsend, excellent songs, and a couple of jokes between them. Anneke joined the stage for the second time today. And did again a good job. The band everyone was waiting for, announced on the DMF edition last year: Testament. Well the wait wasn’t over yet. It took them more than half an hour extra before the thrashing started. Because of the time schedule, the set was shortened. But they did try to make it up, and played a welldone, but short, set. I thought with Exodus there were a lot of crowdsurfers. Wrong. Double the amount in half of the time. 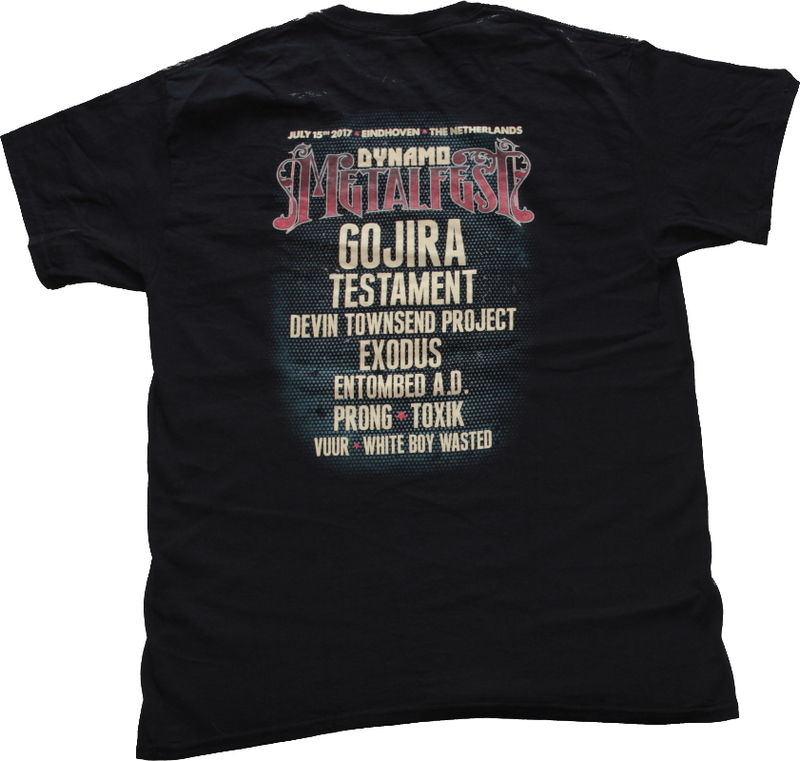 At first it felt a bit strange to see Gojira as the headliner, I would have expected Testament as the headliner. But the frenchmen had the honour to close the third edition. Well they didn’t disapoint me. It was the appopriate headliner. It is a tradition to announce the first band for the next edition during the festival: the first band on the bill for DMF 2018 will be Annihilator! Again a great band with a history. After all it was a good third edition, the weather was nice (technically it did rain, but it were just a few drops, nothing to bother about). I’ll think 10000 is the max for this location, in order to keep it nice. A special thanks to all the volunteers, who made this day a great one (again!). There were a couple of shirts, bought the coloured festival shirt with the logo on front and the list of bands on the back. 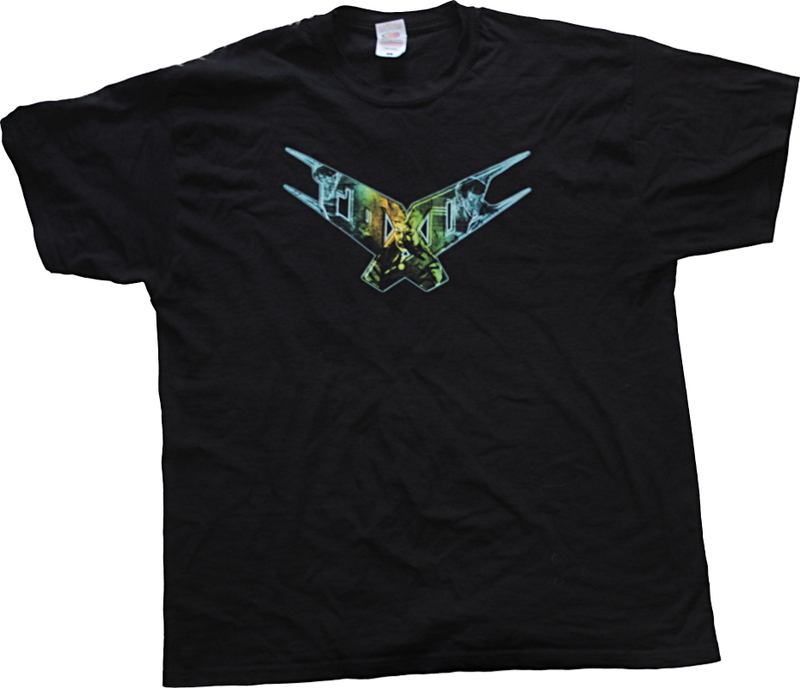 The same one was also available with a green shirt and with ablack-and-white print. Well I ordered the new album of Vallenfyre. I choose the promo-bundle with shirt. Black shirt with album design on the front. 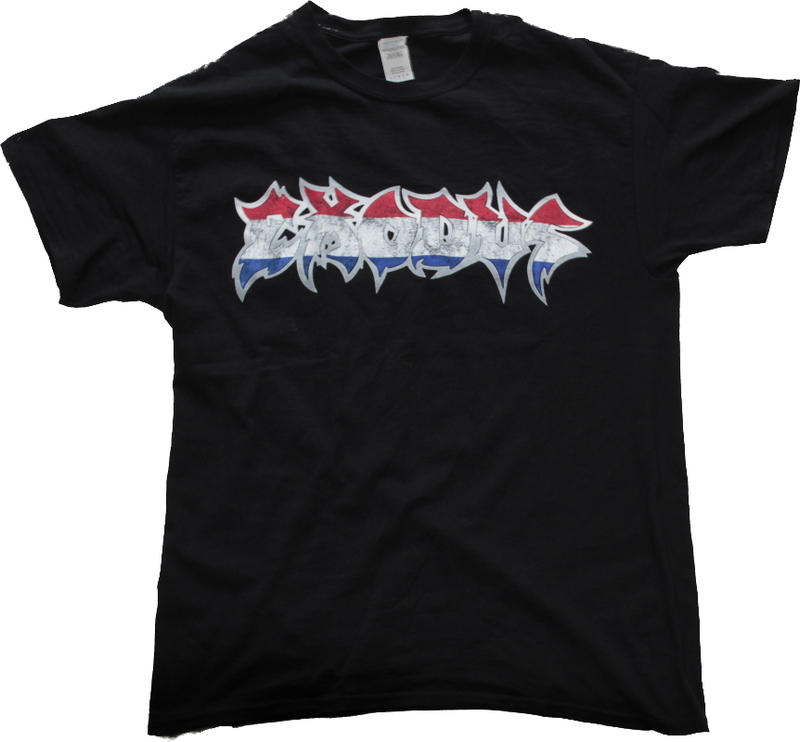 And it seems to be regular with this kind of shirts, no back print. A promo-bundle. When ordering the new album of Anathema (Or is it ana_thema now?) 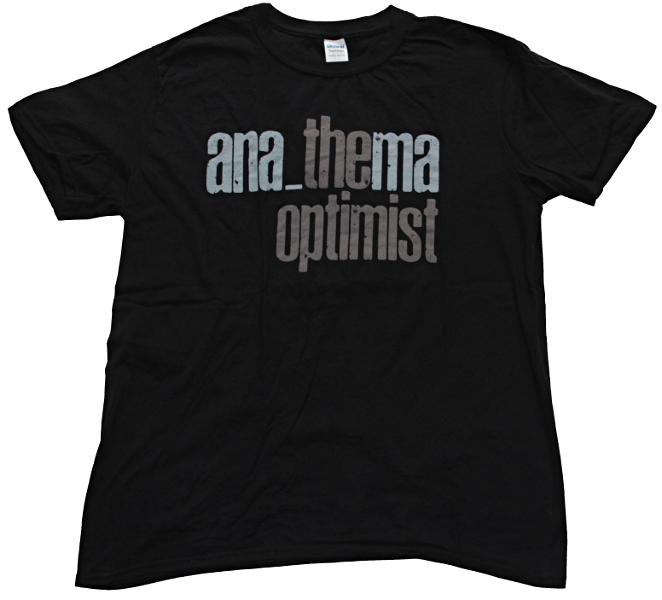 ‘The Optimist’ it came with a shirt. Black shirt with only a print on the front. Only text.